Mallow is not only a useful herb offering various medicinal and nutritional properties, but it is also a lovely ornamental addition to any garden. Mallow, or Malva sylvestris, is a perennial herb believed to hail from Europe and Asia. It now grows all over the world, to the point where it is considered a weed because of the ease in which it grows wild. Its traditional use was at first limited to inducing childbirth and promoting fertility, although during the 16th century, mallow developed a reputation as a cure-all herb and it began to be used to treat stomach and bladder illnesses, and as a soothing ointment for wounds. Reducing swelling and pain. Mallow posses demulcent and anti-inflammatory properties that have been traditionally used for relieving skin inflammations, as well as for soothing throat and mouth infections. Speeding wound healing. Due to its astringent properties, mallow topical application is useful for preventing infections and quickening recovery from cuts and wounds. Additionally, mallow has been used for its laxative and diuretic effects. The main ingredients to thank for mallow's medicinal properties are mucilage, anthocyanins, and tannins. Malvin, an anthocynanin contained in mallow, provides antioxidant and anti-inflammatory effects. The tannins in mallow are responsible for the astringent action, which helps clean wounds and protect the skin from infections. 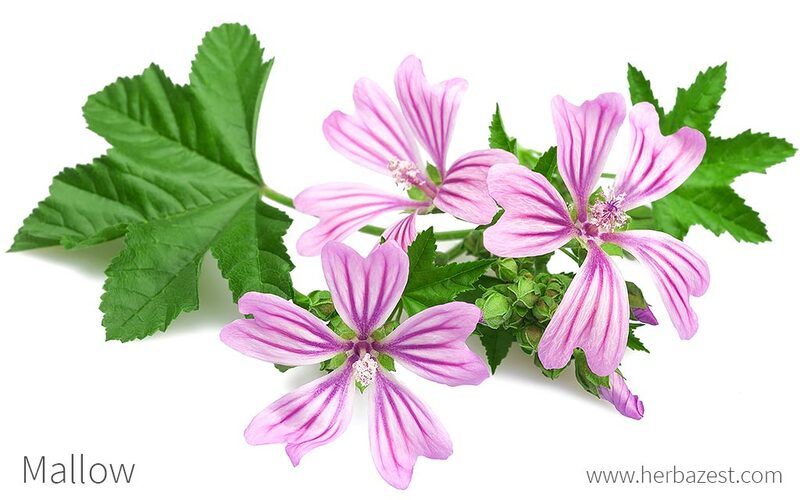 Mallow is helpful for cleansing wounds, soothing insect bites, and reducing swelling. It is also a diuretic and laxative. The mucilage in mallow helps treats mucosal irritations of the mouth and throat that cause dry cough. It acts as a demulcent, forming a protective film over inflamed mucous membranes. Different parts of the mallow plant can be consumed a number of ways, depending on taste preferences and the desired therapeutic effect. Mallow leaves and flowers can be distilled to make liquor. Young mallow leaves can be boiled or eaten raw in salads. Mallow leaves are also added to soups for their thickening effects and pleasant taste. Additionally, raw mallow seeds can be eaten as a healthy snack, offering a nutty flavor. Infusion. The flowers and leaves can be brewed and taken orally for soothing a sore throat, as well as gargled to treat mouth infections. This preparation can also be used topically for disinfecting wounds and reduce skin inflammation. Tincture. This is an alcohol-based preparation that needs top be diluted in water before taking it as a mild laxative, or for soothing irritations in mouth and throat. Cream. As a water-based preparation, easy to be absorbed by the skin, mallow cream can help soothe rashes and eczema. Capsules. The anti-inflammatory properties of mallow are concentrated in this supplemental form, that offer standardized, fixed doses that can be taken orally for the relief of respiratory problems, such as bronchitis, cough, and sore throat. Mallow is sold year-round in most locations worldwide, including nurseries, herbal nutrition shops, and online. Although mallow leaves are not widely sold, they can be easily harvested from a garden. Supplemental forms of the plant, such as tinctures, creams, and capsules, can be purchased in specialized herbal stores and are also available from online retailers. Mallow is a hardy plant that commonly grows in the wild, such as in open areas, roadsides, and wastelands. However, this fast-growing, low maintenance herb can be easily grown at home and it is a popular garden ornamental. The best season for sowing mallow seeds is summer. If it is planted indoors, it should not be transplanted until after the last frost. Plants should be spaced 12 - 36 inches (30 - 90 cm) apart, depending on the size of the variety. Mallow prefers light, well-drained soil or peat moss with an approximate pH of 7.0. The herb can grow in either full sun or partial shade, and requires moderate watering. Mallow is a tall, perennial herb with a pulpy taproot and erect stem. It can grow up to 3 feet (1 m) in height and boasts beautiful pinkish-purple flowers with prominent, dark veins and lobed leaves. Mallow (Malva sylvestris) is a member of the Malvaceae family, which contains 2,300 species spread over 200 genera. This large botanical group contains some economically important and well-known herbs, such as hibiscus, hollyhock, marsh mallow, cola nut, and cacao. Nowadays, botanists do not classify Malva sylvestris into distinct subspecies, but prefer to speak of cultivar groups instead. The subspecies formerly known as Malva sylvestris subsp. malaca is now referred to as the Malva sylvestris L. Mauritiana cultivar group, and it is the predominant type found in the Iberian Peninsula, Italy, and Algeria. The Canescens group hails from further up north (France - Montpelier region), and unlike Mauritiana, it is almost completely covered by fine, white hair. Meanwhile, the M. sylvestris L. Eriocarpa group grows mostly between the Himalayas and Central China, and can be identified because only its seeds and stems are hairy. According to archaeological findings, the first use of mallow was nutritional rather than therapeutic, as evidence points out that young mallow leaves were consumed by humans around the 8th century BCE, possibly due to their pleasant, sweet taste and nutritional value. Sometimes, mallow is given to children to ease teething. Today, mallow is mainly used for medicinal and culinary purposes, as well as an ornamental garden plant because of its pretty pinkish-purple flowers. Mallow is technically considered a weed that grows wild on nearly all continents, so there is no substantial information about its economic value. The biggest industries for mallow, however, are medicinal and culinary. Mallow is often used as a therapeutic herb taken for several ailments or consumed in various soups and salads. Dye. The tannins found in mallow make it useful for dyeing clothes. Fiber. Furthermore, the fibers found in mallow stems can be used for making textiles and paper. Decoration. Traditionally, mallow has been woven into garlands for celebrating May Day.